George Yost had been involved with the Sholes & Glidden typewriter and with the Caligraph, but in 1888 he launched a machine under his own name. It was a blind writing, upstrike machine, but with a new and superior mechanism. The typebars were arranged in a ring, with the type facing outwards and resting against a circular ink pad. On striking a key, the type moves inward and down and then comes up through a solid steel alignment hole under the platen. The result is perfectly aligned and crisp type, because there is no ribbon between the type and the paper. The grasshopper movement of the type brought it straight up through the alignment guide. The Yost was equipped with a full keyboard, like the Caligraph, with separate keys for upper and lower case characters. The Yost 1, that is presented here, had a faceted platen. 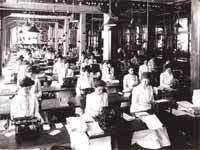 In the early days of typewriter production, producers often used real printer's type to build machines. Printers type was produced to print on a flat surface, so platens had to be made with a flat surface for each line, to obtain good printing quality. 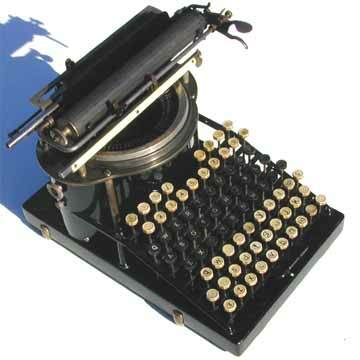 Soon however, special type for typewriters was produced that was slightly hollowed, so that round platens could be used. Two years after the introduction of the Yost, the New Yost 1 appeared, followed soon by the New Yost. Differences in design had mostly to do with the escapement mechanism. The escapement was improved several times on the New Yost. The easiest way to tell a real Yost 1 apart from the New Yost is by the two medallions on the rear corners of the base (pict.6). These disappeared on the New Yost, when stronger supports for the rear of the machine were introduced. The consecutive upstrike Yost models stayed in production until 1908, when Yost introduced a frontstrike visible machine, numbered Yost 15, followed by the last of the Yosts: the Yost 20.